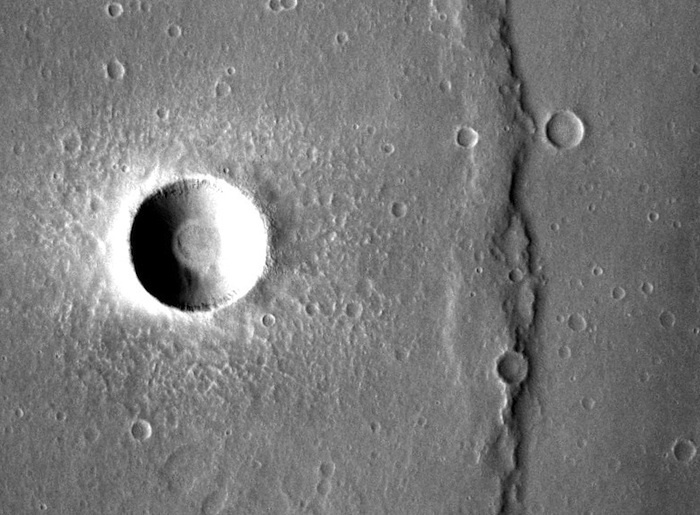 A common feature seen on volcanic plains is a wrinkle ridge. These are long (tens to hundreds of kilometers), low (a few hundred meters high) ridges a few kilometers wide with a gentle slope on one and a steeper slope on the other. The ridge looks like it's, well, wrinkled. One side of the ridge has a steep slope, the other is gentler. Wrinkle ridges often occur in parallel sets spaced tens of kilometers apart. A wrinkle ridge forms when tectonic forces compress a lava sheet that is still slightly soft and elastic. Like the skin of your palm when you cup it, the lava sheet buckles and deforms under the compressional stress. Scientists can tell which direction the movement went by looking at the ridge. The steeper side shows where the buckling rode up and over the lava sheet next to it. This marks the front of the ridge. The surface of Solis Planum shows a great many wrinkle ridges. They are aligned with a push from the northwest toward the southeast.